Appointments are the best approach to getting a tattoo from us. Consultations are free. We do request a $20 deposit for the drawing which will come of the price of the tattoo. If you do not show up for your appointment the artist recieves deposit in payment for the artwork and drawing time. We will draw until you are completely happy on the deposit. A consult and scheduled appointment allows us to discuss what the client has in mind and make sure that we are on the same page. We love to draw..and we like to put our personal touch on each piece, an apointment gives plenty of time for us to draw, customize and redraw. This gives the artist efficient booking time, we like our tattoo clients to feel like they have had appropriate time and attention from are artist and this is achieved by things running smooth. With all of that being said, we do accept tattoo walk ins, but will only do if time and sufficient preparation for the artwork is premitted. Payment. We will only accept cash as do most tattoo shops. The front girl. She is here for all questions and concerns regarding your tattoo and piercing procedure. She has a wealth of knowledge regarding all styles of tattoo's, piercings and is up to date on what is hot and what is not. 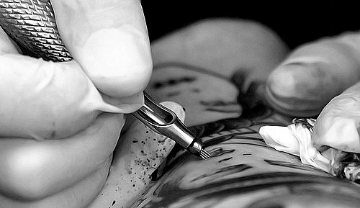 You can feel comfortable going over any custom work you may need if you dont want to schedule a consult or wait to speak to an artist. If theres is any questions on your custom tattoo we will always call you. She can suggest ideas to get the ball rolling, so feel free to bounce ideas of her. The front girl does all the booking, signs our clients up, checks identification, and can go over care instructions. Feel free to come in and ask for a tour of the shop, go over sterilization procedure, and see our autoclave. We like it when our clients are educated on sterilization and make sure that the tattoo purchase is a safe one. She keeps us organized and makes sure the shop runs like a ship. She takes care of you, and us! 1. Unbandage in an hour, and leave open to the air from here on in. 2. Use antibiotic ointment for 4 days 3 times a day, neosporin or bacitracin. Rub into skin as if applying lotion. It should be in it not on it. The surface of your tattoo should appear dry but hydrated. 3..Blot any moisture that appears in the first 24 hours, this is white blood cells trying to form a scab. 4. After 4 days switch to a good lotion, palmers coacoa butter, eucerin, nivia. this you can use as much as needed. 5. Do not pick or itch your tattoo, no swimming, sauna or hot tub, your tattoo will flake but impotant you allow those flakes to come off on thier own. 7. If you have any questions you are always welcome to come in and we can monitor your healing, or answer any questions you may have over the phone. It is equally important to us that the healing process goes well. It has alot to do with the final result. Permanent Make up, Reconstructive tattooing, Camoflage, 3d areola repigmentation. You can request a consultation from me "Melanie". I have been in this field and working for a dermatology group out of Rochester Ny for 8 years. This service is also provided at the shop. I take these procedures very serious, and feel it is some of my most important work. Eyeliner, Eye lash enhancement. This is a beautiful way to enhance your eyes and lashes. Eyebrow repigmentation, For clients that have suffered the loss of eyebrows due to cancer, alopecia, or over plucking, this procedure is one of the most rewarding. This is achieved by implanting pigment in one of two methods, hair simulation or manicured. This regains confidence for the client and frames the face. No more worring if your pencil drawn eyebrows have run! Camoflage. Due to Vitaglo, Scaring, etc, Hypopigmentation is camoflaged and made less visible. Helping a client feel less self conscious is my goal. 3d Areola repigmentation. Due to mastecomy, reduction surgery, or unwanted color, shape and size, scaring from surgery. This is as important to me as it is to the client. It is handled with the privacy it deserves, and i will do my best to insure that you feel whole and beautiful. I hope you come in and check out our tattoo studio. We are very proud of the environment that we have to offer. Once you have meet us, and see what we can do to ensure an amazing experience. You wont go anywhere else. there was a fire in the back section of our building (see story here). The Staff at Rite Of Passage Tattoo in Victor, NY. CLIENT TESTIMONIAL PAGE COMING SOON!